Umeed 1000 Cycothon, a CSR initiative by RBL Bank, which was flagged off in Mumbai on November 30, 2018, has culminated at Manipal Global Academy of BFSI campus in Thanisandra. The closing ceremony was attended by DGP of Karnataka Police – Neelamani Raju along with India Cricketer Gautam Gambhir in the presence of Rajeev Ahuja, Executive Director – RBL Bank and Ravi Panchanadan, MD & CEO – Manipal Global Education Services. Jasmeet S. Gandhi, a cycling enthusiast passionate towards contributing for girl child education, along with RBL Bank employees, led the Cyclothon to garner funds for Udbhav School in Hyderabad. Cyclothon, which was flagged off in Mumbai rallied across varied cities of Pune, Satara, Kolhapur, Belagavi, Hubballi, Ranibennuru, Tumkur and Bengaluru. 50 participants from Karnataka Special Reserve Police also joined from Belagavi to extend their support. Umeed 1000 was launched by RBL Bank as a CSR initiative in 2014. 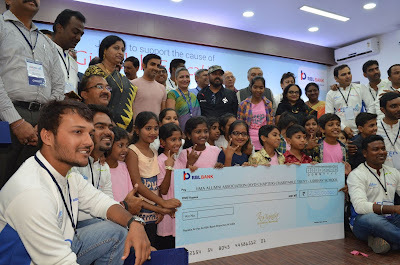 This year RBL Bank is supporting the IIMAAA Hyderabad Chapter Charitable trust to build and support another underprivileged school in Fatehnagar that has been catering to the education needs of students coming from urban slums in the vicinity.